Check out this video to see how we are getting a longer growing season out of some of our summer plants. The cold weather came early this year up in Michigan and we had a few plants that we didn't get to see much production from. Our Bell peppers plants just didn't grow very well this year and ended up getting over crowded in our square foot gardens. 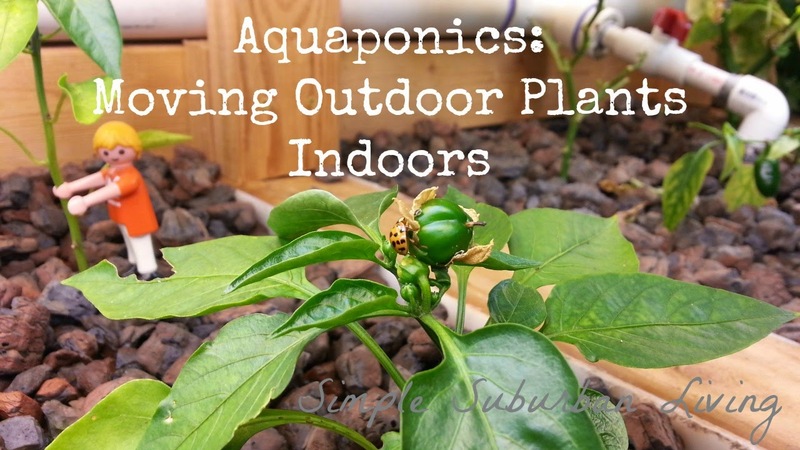 Since we have the aquaponics system going year round it makes it easy to grab anything from the garden at the end of the season that we want to keep going and plant it inside. I have had pretty good luck so far growing indoors with this system and it is so easy to transplant into and out of the aquaponics! I have had the best luck transplanting plants into the system but no the best of luck transplanting out if it. Once most plants get used to the lazy lifestyle of the easy aquaponics growing they don't like to get back into a regular dirt situation. While growing in the system they have easy access to water and nutrients and don't develop very deep thick roots like they would in dirt. So when you move most plants out of the system into a normal garden they have a lower survival rate. I have been able to move out some apple tress that were in the system for awhile but trees develop much differently than most other plants.